Guitar model numbers often look more like an algorithm than a description of the instrument. Guitars like 000C-16RGTEAURA or the DCX1KE have unique features that each letter or number in the model number represents. The reason for these model numbers is to give a brief description of the instrument without using too much space. Martin in particular, has hundreds of different guitar models so a system is needed to distinguish between models. Unfortunately each company has a little different system of classification. I will focus on Martin due to their many different models. We will use 000C-16RGTEAURA as the example. The first thing the model number tells us what body style the guitar is. In this case it is a 000 or a “Triple Ought.” If it were a 00C-16RGTEAURA it would be a 00 body style. D stands for dreadnought, OM stands for Orchestra model, M is a 0000 size, J is for jumbo, and SJ is small jumbo. The C after the 000 simply tells us if the guitar is a cut-away or not. A 000C-16RGTEAURA has a soft cut-away where a 000-16RGTEAURA does not. The second part of the model number gives features that aren’t related to the body style and size. The 16 is the series that the guitar is part of. Martin has a number of different series’ and each series have unique characteristics. The 16 series is different from the 28 series which is different from the 45 series etc. The R means that the back and sides are made from Rosewood. In this case it is East Indian Rosewood. A standard 16 has Mahogany back and sides so the R is needed to note the difference. The next part of the model number is the GT which stands for gloss top. Most of Martin’s guitars are gloss top but some of the entry level series offer a satin finish instead of the gloss. The E means that the guitar has onboard electronics. A 000C-16RGT would not have a pickup from the factory. 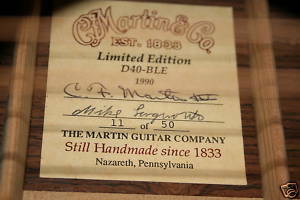 The AURA tells us that the guitar has Martin’s AURA electronics. So dissected, the guitar is a triple ought 16 with a cut-away, rosewood back and sides, a gloss top, and the AURA system for electronics. The DCX1KE is a dreadnought cut-away, part of the X1 series, has Koa style HPL back and sides and onboard electronics. Taylor uses a similar system of classification but uses a different order. Let’s look at the 814CE. The 8 tells us it is part of the 8 series which means it has Indian Rosewood back and sides and a Sitka Spruce top. The 14 is the body style which for Taylor is their concert model. The C says it a cut-away and the E means it is acoustic/electric. Gibson has an even different way classification. It started in Gibson’s early years of building. They use a letter to tell the body style and a number to tell the other features. Gibson is different because the number first came from how much the guitar originally cost. The J 50 for example, cost $50 when it was new while the J 200 cost $200. If they stayed with that tradition, they would have to call the J 200 the J 4,295. All the numbers and letters look a little confusing but they all mean something and are much shorter than writing everything out. So next time you are at Guitar Center, you won’t have to ask the guitar salesman what K65CE stands for.